Retained intravascular foreign body is a well-known complication of central venous access placement in children as well as adults. Most of these foreign bodies are radio-opaque and hence are removed under fluoroscopy guidance. 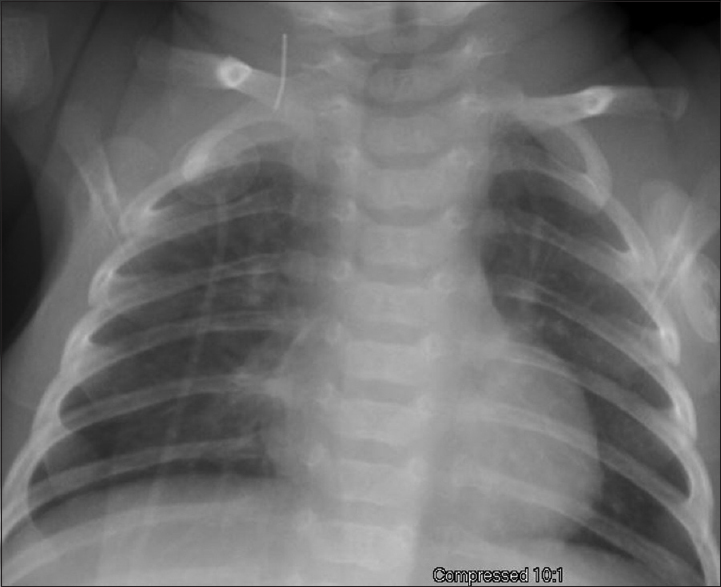 In our case, we describe the removal of an intracardiac radiolucent foreign body in an infant utilizing a combination technique - transesophageal echocardiogram and fluoroscopy. The use of vascular access lines in both central venous and arterial sites has significantly increased in the past decades. Indwelling central venous and arterial catheters are used for indications such as dialysis, apheresis, chemotherapy, total parenteral nutrition  or in cases of difficult peripheral access for administration of medications or intravenous fluids. Several complications associated with central vascular access have been described. These include bleeding, infection, air embolism, cardiac arrhythmias, vascular damage, and embolization of catheter or guidewire fragments., Guidewire fracture and intravascular retention are well-described complications during central venous access placement in both adult and children. These retained fractured elements are usually removed under fluoroscopy guidance since the catheter and guidewire material are generally radio-opaque and are easily visualized under fluoroscopy. We report a case of removal of a radiolucent, uncoiled, fragmented portion of the guidewire using both fluoroscopy and ultrasound guidance. A 1.5-month-old term, male infant weighing 3.0 kg, was transferred to our institution for intensive management of bronchiolitis. One week before the transfer, the patient had undergone endotracheal intubation and unsuccessful attempt at the right subclavian central venous access. During the attempt, the guidewire (Cook 035” diameter, Teflon straight tipped) became entrapped inside the access needle. The wire was sheared off at the needle tip during attempts to remove the wire. Chest X-ray and ultrasound scan of the neck showed a radio-opaque foreign body in the neck at the level of right clavicle, consistent with retained wire fragment in the right internal jugular vein [Figure 1]. The fragment measured 1 cm in length. Under fluoroscopic guidance using a right femoral venous approach, the removal of the retained wire fragment was attempted with a 5 mm Amplatz GooseNeck ® snare by the interventional radiology team. 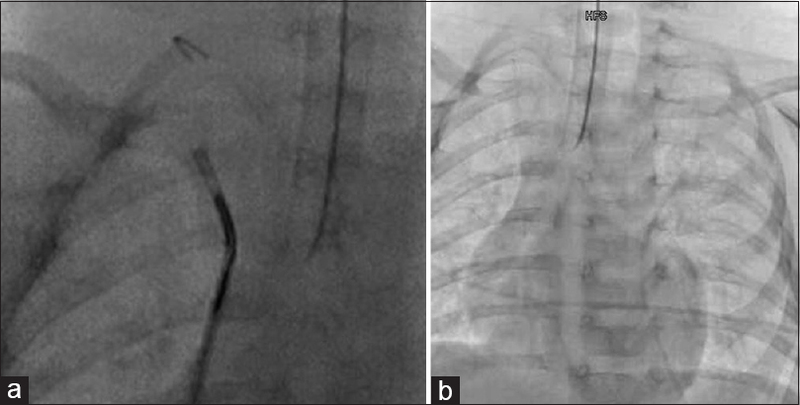 The retained fragment was captured with the snare, but while attempting to pull it out through the snare catheter, the wire fragment “uncoiled” and became radiolucent and no fragment could be retrieved [Figure 2]a and [Figure 2]b. 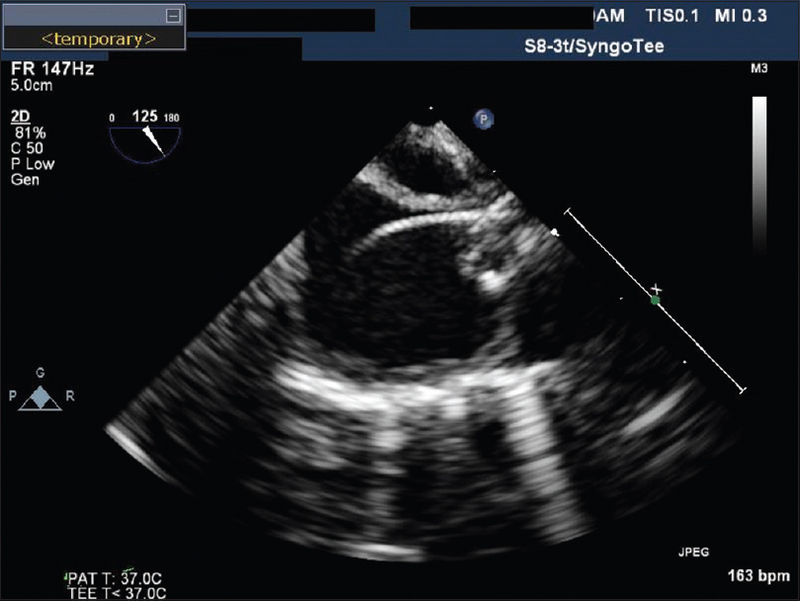 An echocardiogram demonstrated a linear echo-bright material extending from the superior vena cava (SVC) to the right atrium and into the right ventricle across the tricuspid valve [Figure 3]. The patient remained asymptomatic without cardiac arrhythmias or hemodynamic instability. The patient was then referred to the catheterization laboratory for the removal of the uncoiled fractured guidewire. Since the fractured segment was no longer radio-opaque, the procedure was performed with both transesophageal and transthoracic echocardiographic guidance along with biplane fluoroscopy and cine [Figure 4]. Under general anesthesia, a 6-Fr central venous sheath was inserted percutaneously into the right femoral vein. Initially, a 5 mm EV3 Amplatz GooseNeck ® snare catheter assembly was inserted through the right femoral venous sheath and advanced to the SVC to attempt to remove the retained guidewire. Despite multiple attempts, the fractured segment of the guidewire could not be securely held with the snare. 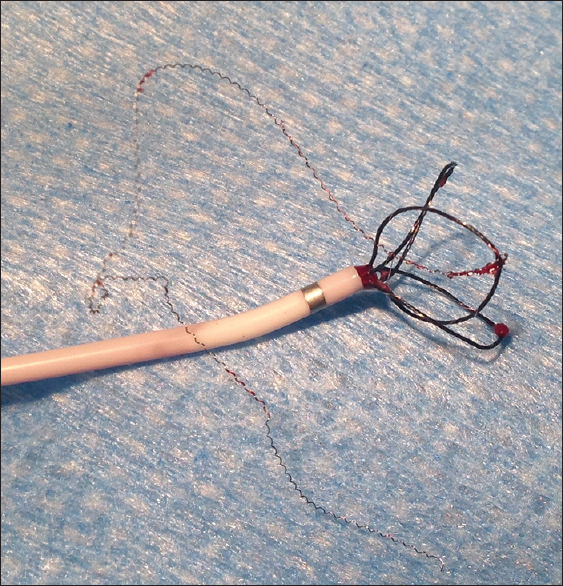 Subsequently, a 6-Fr Atrieve ™ 9–15 mm vascular snare assembly was used. With transesophageal echocardiographic guidance, the retained guidewire was snared and removed through the right femoral vein [Figure 5]. The snare technique required the wire fragment to be pressed against the right atrial wall before it could be grabbed by the snare. Examination of the retrieved guidewire fragment confirmed the original speculation that the guidewire uncoiled during the previous retrieval attempt rendering it longer and radiolucent. After the removal, the fragment measured 11 cm in length compared to the original length of 1 cm. Follow-up evaluation with ultrasound and cine of the SVC, heart, inferior vena cava, iliac, and femoral veins showed no evidence of any retained foreign body. Postprocedure echocardiogram showed no injury to intracardiac or vascular structures and no pericardial effusion. 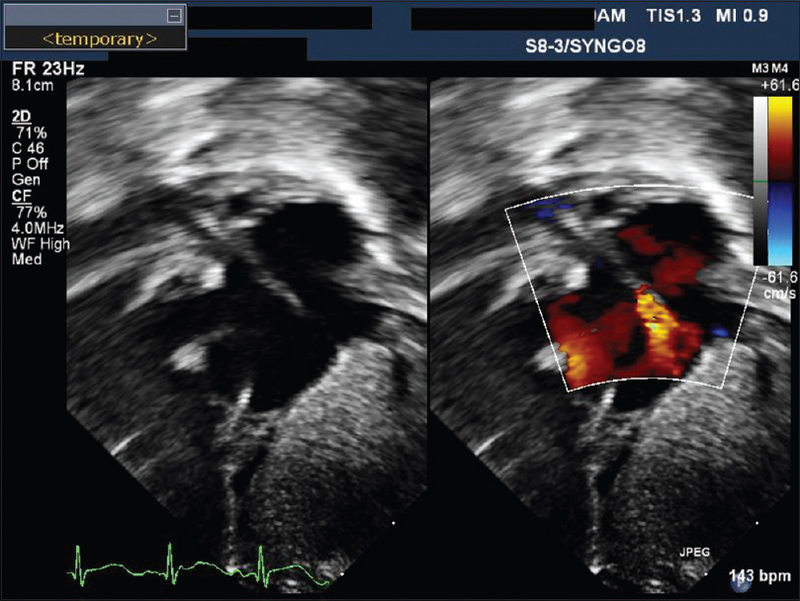 This case report describes the utility of combining transesophageal echocardiography and fluoroscopy for the removal of a radiolucent intracardiac guidewire fragment. The retained wire segment was initially radio-opaque but had been rendered radiolucent by “uncoiling” during the initial retrieval attempt. The structure of guidewires consists of central ribbon wire and core wire surrounded by a coil spring [Figure 6]. Guidewires with diameter over 0.032” usually have both ribbon wire and core wire but guidewires with lesser diameter have only core wire inside the coil spring. The wire used to manufacture the coil spring has a diameter of 0.001” making it radiolucent once uncoiled. Retention of a fractured guidewire segment during central venous access placement is a well-documented complication. Chow et al. reported an incidence of catheter fracture and embolization of 6.7/1000 PICC insertions. The techniques described, mainly in the interventional radiology literature for removal of these retained foreign bodies involve use of fluoroscopy as the mainstay of image guidance since the majority of the retained foreign bodies are radio-opaque. The reported success rate is 71%–100%, with fluoroscopy alone for guidance.,, This standard technique alone is insufficient when the retained fragment becomes uncoiled, making it radiolucent as in our patient. Despite the radiolucency, the fragments remain echogenic. Thus, the fragment could be removed only with a combined image guidance technique - fluoroscopy to guide the vascular snare movement and echocardiography to guide the precise intracardiac location. Having access to a variety of vascular retrieval devices was crucial to the success of this case. A long narrow radiolucent wire that extended from the SVC to the right atrium and right ventricle is not amenable to retrieval by a standard Amplatz GooseNeck ® snare. The Atrieve™ snare with its open flower-like configuration was the optimal device in this case. Obtaining central venous access in neonates and infants can be challenging. Careful attention to various steps of the Seldinger technique is critical for a safe procedure. In this case, the original guidewire must have inadvertently entered the right internal jugular vein from the right subclavian vein and during attempts to reposition, became kinked at the needle tip. Attempting to remove the wire alone in this circumstance, results in the shearing off of the wire as happened in this case. The right step, once the wire cannot be removed smoothly is to remove both the wire and the needle together and start over. Use of a combination imaging guidance technique with ultrasonography and fluoroscopy can be used to retrieve an intracardiac radiolucent retained foreign body. Fadrowski JJ, Hwang W, Neu AM, Fivush BA, Furth SL. Patterns of use of vascular catheters for hemodialysis in children in the United States. Am J Kidney Dis 2009;53:91-8. Carausu L, Clapisson G, Philip I, Sebban H, Marec-Bérard P. Use of totally implantable catheters for peripheral blood stem cell apheresis. Bone Marrow Transplant 2007;40:417-22. Matsuzaki A, Suminoe A, Koga Y, Hatano M, Hattori S, Hara T. Long-term use of peripherally inserted central venous catheters for cancer chemotherapy in children. Support Care Cancer 2006;14:153-60. Puntis JW. Percutaneous insertion of central venous feeding catheters. Arch Dis Child 1986;61:1138-40. Mehta R, Lee KJ, Chaturvedi R, Benson L. Complications of pediatric cardiac catheterization: A review in the current era. Catheter Cardiovasc Interv 2008;72:278-85. Fazeny-Dörner B, Wenzel C, Berzlanovich A, Sunder-Plassmann G, Greinix H, Marosi C, et al. Central venous catheter pinch-off and fracture: Recognition, prevention and management. Bone Marrow Transplant 2003;31:927-30. Cahill AM, Ballah D, Hernandez P, Fontalvo L. Percutaneous retrieval of intravascular venous foreign bodies in children. Pediatr Radiol 2012;42:24-31. Chow LM, Friedman JN, Macarthur C, Restrepo R, Temple M, Chait PG, et al. Peripherally inserted central catheter (PICC) fracture and embolization in the pediatric population. J Pediatr 2003;142:141-4. Woodhouse JB, Uberoi R. Techniques for intravascular foreign body retrieval. Cardiovasc Intervent Radiol 2013;36:888-97. Dondelinger RF, Lepoutre B, Kurdziel JC. Percutaneous vascular foreign body retrieval: Experience of an 11-year period. Eur J Radiol 1991;12:4-10. Surov A, Wienke A, Carter JM, Stoevesandt D, Behrmann C, Spielmann RP, et al. Intravascular embolization of venous catheter – Causes, clinical signs, and management: A systematic review. JPEN J Parenter Enteral Nutr 2009;33:677-85.